In our scriptures, the great sages have given special importance on sanskars. A person without sanskar is regarded as an impure person. That’s why at different phases of life different types of sanskars are prescribed in Hinduism. A person with sanskar becomes well-cultured and well mannered. Sanskar gnerates good habits in a person. The different types of rituals performed during the sanskars and the mantras chanted during that time are useful for welfare. Significance of the rituals and mantras has also been scientifically proved. There are 16 types of sanskars in Hindusim. 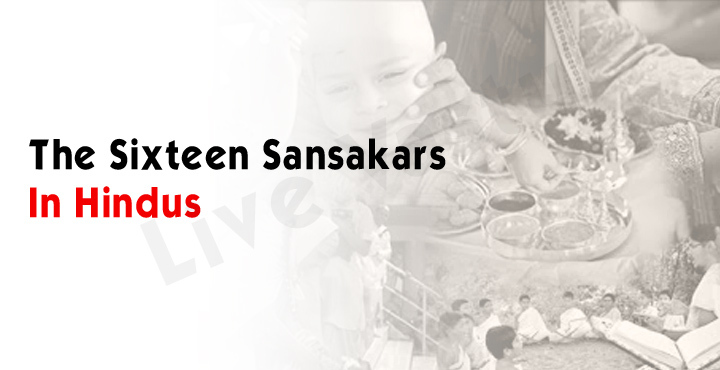 Sanskaras gave deep association with the growth and progress of our life. A human life is not complete without sanskar. Sanskar is an important pat of a human life. Garbhadhaan Sanskar: It is related to the birth of a child. The husband and the wife need to follow garbhadhaan sanskar in order to get a virtuous child. The nature of the child depends on the sanskar that its parents follow during conjugal relationship. It is advised that the wife should think of the husband after ritu-snaan. Likewise she can expect an intelligent, and virtuous child. The time for union between husband and wife is also mentioned in our scriptures. It’s the third prahar of night (approximately 12-3 am). They parents can expect a good-natured child. A couple is not supposed to make love during menstrual period, during the time of sorrow, during the intersection of day and night, and during the time of fear anger. Pungsavan Sanskar: The scriptures advice us about pungsavan sanskar for good health and the growth of the child in womb. It has also proved by modern science that the growth and development of a child in womb is affected by the behabiour of parents. Through pungsavan sanskar, our scripture ensure the proper growth of the child in womb. After the conception of three months, the mother should pray to God every morning and evening for the birth of a healthy, and good natured child. Like this, a desirable child can be got. Pungsavan sanskar is equally important in modern time too. Seemantonnyan Sanskar: This sanskar has also a great importance in a person’s life. In the 4th, 6th and 8th month of conception, seemantonnayan is done. This is performed for the protection of the child in womb. After the 4th month, the development of the organs of the child starts. The child gets consciousness. Wishes are also born in the heart of the child, and such wishes get expressions through the heart of the mother. The sanskars of the mothers influences the nature of the child during these days. This is called in-born sanskar which lasts forever in the life of the child. Jaatakarma Sanskar: Jaatakarma sanskaar is done after the birth of the child. This sanskar welcomes the child to the new world. In this sanskar, the father gives honey to the child to taste and that father pray for the good health of the child. Naamakaran Sankar: Naamakaan has a great importance in the life of a child. The child gets recognition through a name in this world. The naamkaran sanskar is done on the completion of 10 days. During this sanskar, the darshan of Sun is also done. The astrologer calculates the positions of different planets on his birth and his lunar sign (Rashi) is determined. On the basis of the lunar sign, a meaningful name is given to the child. After worshipping Sun, Moon, and the other gods, the child is shown the Sun and the Moon for the first time. Annaprashan Sanskar: The literary meaning of the word Annaprasan is “Taking sanskari food”. When the boy reaches 6-8 months or the girl 5-7 months annaprasanna is done. In this sanskar, the child is given solid food apart from milk and other liquid food. From this day only the child can start eating solid food. After worshipping gods, the child is given light solid food like kheer etc. Annaprashan is done in an auspicious moment. The time is calculated by an astrologer as per the Vedic astrology. Chudakarm Sanskar (Mundan): after this chudakarm sanskar , the child becomes long lived, becomes good looking and develops interest for good works. In chudakarm, the hair of the child is saved off for the first time. This ritual is performed before the end of the first or the third year of the child. On special case, it can also be performed on 5th or 7 th year of the child. Churakarn is often performed in temples because of the divine atmosphere required for it. Karn Vedh Sanskar: Karn vedh has special importance in Hindu traditions. It should be done in 3rd year, 4th year or in any other year of odd number. On an auspicious day at auspicious time, after performing puja and prayer, karnvedh should be done in sunlight. And ear rings should be offered to the child. In case of a boy, the karnvedh should start with the right ear and incase of a girl, the karnvedh should start from the left year. Karnvedh has also scientific importance. It maintains the regularity in the menstrual cycle of a girl. It also helps a girl to get rid of hysteria and other disease. The earrings also helps in maintaining the flow of electric current in a human body. Vidyaramb Sanskar: Vidyaramb is associated with the starting of formal education in a child’s life. When a child attains 5th year, his vidyarambh sanskar is performed. The child is taught the alphabets. Before starting education, it is advised to pray to Lord Ganesh or Lakshmi. The child is also required to offer respect to the guru as the guru will offer him valuable knowledge that will enable him to be a good human being. A person should start education from an auspicious day. Upanayan Sanskar: Upanayan is the ritual where the boy is offered a sacred thread. Upanayan sanskar is to be followed by Brahman, kshatriya and vaishya. The sacred thread has some strings. Each one has a specific meaning. It reminds the person who wears this of the principles that he should abide by in carrying out his duties. After the upanayan, the boy gets the right to perform religious rituals. Vedarambha Saskar: To lead a meaningful life, the knowledge of Veda is essentials. Our scriptures ask us to read the Vedas and acquire priceless knowledge. Vedarambha sanskar marks the beginning of the formal studies of the Vedas. After the upanayan sanskar, a person is supposed to start the study o the Vedas. Shaant Sanskar: After the vedarambha sanskar, Shaant sanskar is performed. In ancient time when the students went for Vedic studies, they cut their nails. Then they worshipped the gods. This sanskara was called shaant sanskara. Samavartan Sanskara: brahamcharya brat indicates the end of student life. Samavartan sanskar is performed at the end of 25. The boy attains his youth. He spends a phase in his life studying books and acquiring knowledge. Through samavartan sanskara a boy is welcomed to home as a learned person. Gods and goddesses are also worshipped so that the boy is blessed to lead a successful life. It’s the arrival of the boy from brahmacharya ashram to grihastha ashram. Vivah Sanskar: This sanskar is the source of life. No evolution of the world is possible without this sanskar. It’s leads the society in a proper way. In Hindusim, marriage is a never-ending bond. In Hindus tradition, the objective of marriage is to form the foundation of a family. Braham Vivah is regarded as the best form of vivah. The vivah performed following the vedic rituals is called braham vivah. It’s mentioned in our scriptures that a child born from braham vivah liberates 21 generations from curses. Anteshti Sanskar: It’s associated with the last rituals of a person when he dies. Anteshti sanskar is called antim sanskar as it’s the last sanskar in the life of a person. The body is cremated chanting mantras. All the relatives, friends and well wishers also assemble at the cremation ground to express their sorrow. Anteshti sanskar is performed for the peace of the departed soul.